Soroptimist International Middlesbrough has kindly donated a supply of sanitary products to the Acklam Green Centre, which are available to girls and women who are unable to afford to purchase them themselves. The Middlesbrough branch of SI, a global volunteer movement working together to transform the lives of women and girls, is supporting the #EndPeriodPoverty campaign with the donation of the products which have been made available for any Acklam Green Centre customers or local-residents to access discreetly. Pauline Reed membership officer and immediate past president from SI Middlesbrough, said: “It’s a heart-breaking reality that one in 10 females are unable to afford sanitary items here in the UK. Any females who require products should visit Acklam Green Centre’s reception desk and ask for the ‘toiletries box’ where they will be handed a box to take into a private room and select their required products before handing the box back in. A sheet has been left in the box to note down which products have been taken so that centre staff can monitor items that require replacement. Soroptimist International (SI) Middlesbrough meets at Acklam Green Centre on the third Thursday of every month between 7pm and 9pm. The group consists of friendly, lively and energetic women from all walks of life and of all ages who work together using our various skills and talents to make a difference to the lives of others through awareness-raising, lobbying, practical help and fundraising. Actes’ Facilities Manager Donna Smith is true reflection of the organisation’s commitment to helping people to fulfil their potential, having progressed from an administrative role to Facilities Manager over the course of the past 15 years. Donna is one the organisation’s most long-serving members of staff having started life with West Middlesbrough Neighbourhood Trust (as Actes was formerly known) in 2003 aged 19. 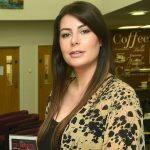 With a Middlesbrough Council Business Admin apprenticeship under her belt, Donna’s first role as Neighbourhood Trust Development Officer saw her putting her admin experience into practice by providing support to the Neighbourhood Manager at People’s Panels and Resident Groups, as well as organising various community events including family fun days. In 2007 Donna moved into the role of PA to the Chief Executive/ Office Manager and remained in the role during the organisation’s transition from WMNT to Actes. In 2011 and with Actes’ current Chief Executive Sandra Phillips now in post, Donna was given the chance to really make her mark with a secondment to set-up and kit-out the organisation’s newly-built state-of-the-art venue, the Acklam Green Centre. This varied role involved managing everything from decorating and furnishing the centre’s meeting and conference rooms to setting up all the relevant policies and procedures including those relating to Health and Safety. Donna took a career break in 2014 to have son Elijah and upon her return from maternity leave later that year she was asked to take on the broader role of facilities manager for Actes. In addition to running the Acklam Green Centre, the promotion involved having overall responsibility for the organisation’s other business and community centre, the Resource Centre in Meath Street, as well as its housing stock. Today Donna manages a team of 15 members of staff who work between the two facilities, including Acklam Green Centre’s café and in-house catering facility, Café Connect. She also has overall responsibility for driving business at the two centres, taking on-board customer feedback to improve customer-service, and it is this aspect of the role that continues to offer Donna the most job satisfaction today. During Donna’s time with Actes she’s had the opportunity to undertake a substantial amount of training and development, achieving an NVQ Level 4 in Information Advice and Guidance (IAG) to support her early community work, an NVQ Level 3 in Team Leading, an NVQ Level 3 in Customer Service and an NVQ Level 5 in Management and Leadership. Additional courses that add to her CV include First Aid and Equality and Diversity. In addition to managing her busy and varied role as Facilities Manager Donna is mum to four-year old son Elijah. The Summer Holiday came early to the Acklam Green Centre when it hosted another Dementia Friendly screening. An audience of forty people living with Dementia, and their friends, family and carers, attended a film screening of the classic Cliff Richard musical following the success of two previous events. 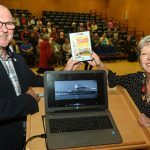 The screening was organised in partnership with Brian Rowcroft, business engagement lead for Dementia Friendly Middlesbrough, a project that continues to develop Middlesbrough as a nationally recognised dementia friendly community. The screening was shown in the centre’s large conference hall to create a safe and comfortable cinema experience for those living with dementia; sound and lighting levels were adjusted to ensure the event wasn’t overwhelming for attendees. Members of the audience were also encouraged to express themselves freely during the film including talking, singing and moving about which culminated in an enthusiastic rendition of the title song. Acklam Green Centre staff have completed dementia awareness training through the Alzheimer’s Society’s programme which is designed to transform the way the nation thinks, acts and talks about dementia. The venue itself is recognised as being dementia-friendly having been assessed against the dementia friendly physical environment checklist. Ahead of the screening Dementia Friendly Middlesbrough was presented with a cheque by Councillor Denise Rooney of a donation of £5000 raised by bereavement services. Brian Rowcroft, business engagement lead for Dementia Friendly Middlesbrough, said: “I am delighted that Acklam Green Centre continues to take part in this initiative to support people living with dementia in the Middlesbrough community.